12oz brown with a best by freshness date. SMELL: Cascade hops, fruity, citric rind, mint, nutty grain, mild malt sweetness. A great pale ale to be had here, any hop head would be pleased and if you love cascade hops this is your ale! A great snapshot of what an PNW Pale Ale. Mirror Pond pours a pretty golden-amber with a one-finger, snow-white head into a pint glass. The body is see-through and looks to contain medium carbonation within. Lacing left on the glass is frothy and clingy. First smell reveals light citrus notes of orange and lemon, with a nice caramel and biscuit malt influence. The aroma is very fresh and speaks of a well-struck balance between hop and malt. There are some faint smells of melon also mixed in. Mirror Pond tastes very much how it smells, with delightfully light hoppy notes of orange, lemon, and melon, with just a slight pine flavor, as well. The malt flavors of caramel and biscuit blend very nicely with the hop flavors and produce a well-blended, tasty pale ale. The finish is just dry enough, certainly not bitter, though. The mouthfeel is wonderful. About medium bodied for a pale ale, the carbonation is nicely effervescent and harmonizes perfectly with the subtly bitter hop bite. A dry finish caps it all off. This is a really well crafted pale ale. Extremely sessionable and tasty, without being over the top at all. Another Deschutes brew that has impressed me greatly. Best pale ale I have ever had. Try with splash of lime. Heaven. A very very nice pale ale. I had one of these sitting next to the pool and thought "An absolutely excellent summertime brew!" This beer is expertly crafted and pleasant to drink. Nothing unusual about it, simply a well crafted beer. A bullseye of a pale ale. Deschutes hits the mark. Great balance, not too sweet, not too bitter. Malty with a touch of citrus. Just right for summer. Well definitely revisit. Best pale ale I've ever had. Sierra Nevada's good, but I found this more perfectly balanced and refreshing. Wish I could find it here in the Southeast. The clear bright copper/amber colored beer pours out into a Duvel glass with a 1/2” off white head that recedes slowly but visibly to a thin cover over most of the surface while leaving a persistent pattern of lacing on the sides of the glass. Sipping creates a couple of arches and lots of small patches and legs of lacing. The flavors are much as expected from the nose with the pine needles and grapefruit from the hops as well as a noticeable caramel sweetness from the malt backbone. The malt and its sweetness are in a very nice balance with the bitterness in that neither conceals the other and each keeps the other from becoming unpleasant. The mouthfeel is medium bodied and a bit prickly from the moderate carbonation. The fairly long finish begins as the caramel sweetness briefly allows the pine and grapefruit to become more prominent as they are all slowly fading. Both the malt sweetness and the fruity, citric and piney bitterness from the hops are present throughout the finish to the clean, crisp semi-dry lingering ending. Overall, this is a very drinkable beer with a very well balanced interplay between the hops and the malt. I definitely expect to be having more of this one since it is a very enjoyable APA and I could see adding it to my regular rotation of APAs. This beer is a dark blond (think burnt orange) with good carbonation and a nice thick, off white head that’s very bubbly frothy and just overall inviting. I hope hell is this soft when I get there! You can smell the hops right away, some mild citrus fruits aromas with some wheat mixed in. Its got a medium-to-light body and is crisp on the tip of your tongue with mildly tangy kicks when it hits the sides and back of your mouth. The hops are present and very welcoming and like those overbearing mother-in-laws or grandma’s that always say” here you go, have a little more food, you’re too skinny”. The aftertaste is nice and smooth, the hops pick up a little more and there’s a slight grapefruit taste in there too. Not bad beer over all, I can’t wait to have this one again. On tap in SF - Really clean tasting, slightly fruity pale ale. Not overpowering at all. Just pure spring water with wholesome beer goodness. Hopefully this is as good in a bottle and hopefully it will make its way to this side of the Mississippi soon. A: Pours a dark and hazed caramel amber color with a bit of golden-orange hue to it. Some nice bubble action is visible and produces a thin cap of off-white creamy whip. Retains for just a few, leaving some lazy splashes of lace down the glass. S: Smells of sour orange peel with a firm pine aroma. Hops give way to some warm yeasty bread with a touch of caramel and spice. Pleasing aroma overall but nothing really stunning here. T: Tastes is prominent with dry bitter pine cone and some spiced orange flesh. I get a bit of fresh orchard apricot that transitions into the caramelized bread and graham malt characters. There is a moderate amount of bitterness producing just a hit of sharp pucker. Otherwise very smooth with no real alcohol presence. Nice flavors and well balanced. M: Very smooth and creamy in texture with a moderate to low feeling body. Has a nice dry crisp finish with some lingering hop oils. 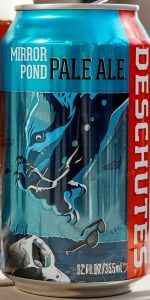 D: Another nice "standard" from Deschutes. American “C” hops showcased through a nice bready pale ale. Smooth, tasty, and well balanced. Very drinkable. Nothing revolutionary by today’s standards but Deschutes has such great quality in their brews. Had on-tap at Deschutes in Portland, OR. Poured a nice clear orange/yellow color with a moderate white head that receded slowly leaving some spotty lacing on the glass. Aroma was hoppy (earthy, citrusy, grassy), malty and I smelled a touch of wheat. Taste followed the nose...I really liked the light hop profile of this one. I was surprised at how smooth it was given the amount of hops I tasted, but I think it was just an excellent balance of malts and hops, making it very drinkable/sessionable. Light-medium in body with moderate carbonation. Overall, well-balanced and a good representation of the style. Would have again. Poured from a 12 oz. brown bottle with the freshness date 2/18/14 clearly printed on the label into a pint glass and I get 2 finger of white head. A: Pours a clear golden color with 2 fingers of head that dissipate at a moderately slow rate. There is more than just a covering on the top of my glass that last to the end. A fair amount of lacing covers most of my glass. S: I smell pine, lemon grass, and some malts. T: Citrus, pine resin and a hop bitterness is balanced with slightly sweet malts. M: More than medium bodied and medium carbonated. This goes down good. O: I think this is a very nice pale ale. I like it and would have it more often if the code dates were fresher. Sometimes I find this beer on the shelf past the freshness date. This is an extremely drinkable beer that I can enjoy without affecting me too much because of a high alcohol content. I recommend it and I am going to have another. Bottle poured into a pint glass. A - Pours out a pale yellow with strong lasting head. S - A strong hop aroma with citrus dominating. T - A great balance of sweet malt and citrus hops. Malt start and a rich hop finish. M - Tangy and rich with good carbonation. O - I was excited that Deschutes started distribution in KY and wasn't disappointed. This is an outstanding Pale Ale. This beer is my favorite non stout out there. It is awesome on nitro, gorgeous in the bottle, and a classic on tap. Gorgeous, balanced lovely beer. I think it is ugly and tinny in a glass, so I keep it in the bottle or drink it in a dark bar. Who cares how it looks? It is a 5 star beer! A little darker in appearance than I'd expect a Pale to be. Think mahogany. Clear with a head of dense white foam. Aroma is muted. Soapy undertones support light hops and barely-there malt. Taste suits the aroma. Light malt made crisp by the hops, but neither dominates or distinguishes. Clean, slightly fruity aftertaste, tongue left pleasantly scoured afterwards. Just smooth. All smooth. Light and cool Sunday at my homeboy's down at the beach; and while staring at the ocean blissfully glisten, it reminds Raul of Mirror Pond. Easy on all levels - not Paris Hilton easy - but perfectly easy in its grace and subtlety. Like a Rita Hayworth hair flip, Raul enjoys this.